The circlets consists of the main front portion and a removable rear segment, which is centered by dowel pins and held by the spring force of the larger main part. So to open and close it requires some effort - the thicker the material the more of it. Do you wish a Talena lockable collar? This is possible for Talena necklaces with a thickness of 8mm (for any size) or of 10mm (for an inner circumference size 40 or more because the material is less flexible). You find a small hex screw in each of the male parts of the socket system. Because these screws are situated inside, they can hardly get lost. The hex screws are operated with a key through very small drill holes at the lower side of the main part, so the lock mechanism is not visible when the collar is worn. Delivered with two keys. To open and to close the collar the segment has to be taken out and fitted in again. To do so a certain force is necessary. 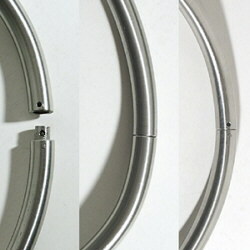 Please make yourself familiar with the locking mechanism before closing the circlet around any part of the body. Keep away from children. To open the cirlet you best grasp its main part with your fingers. Then turn the key counterclockwise until it stops, then turn back clockwise approx. ¼ to ½ rotation, pull out the key and repeat this procedure at the second lock. The collar can be opened now by pulling apart the segments at the marked points. You can absorb the shock that emerges from opening with your thumbs pressing on the circlet. Because the parts are made with small tolerances we advise to keep them clean. To close the collar, position the segment on one side and fit it in the other side by pushing it in from the outside to the inside until it snaps in. To avoid bruises keep a sufficient distance to your body or maybe put a piece of paper between body and circlet. To shut it insert the key and turn it clockwise until it stops. Do not tighten the screw. The piece will already be securely locked when the screw stops. The lockable bracelets and anklets have two halves that are put together and also locked with a hex srew in each half. One of the adjusting pins is spring mounted and can be operated with a special hook-key through a little drill hole (see photo). The lock mechanism cannot be seen from outside apart from that small hole. Delivered with two keys. Please make yourself familiar with it before closing it around a part of the body. To open, insert the key-hook into the small hole. While slightly pushing down, move the key towards the upright position. With this movement the tip of the hook is pushing back the spring bolt, so that the bracelet can be opened. If the segment is quite tightly sitting in the C-shaped main part it might be necessary to push the segment part a bit towards the middle of the bracelet to make it possible that the bolt can move without friction. If you wear your Talena for a longer period of time we recommend to operate and clean the locking mechanism once a week.